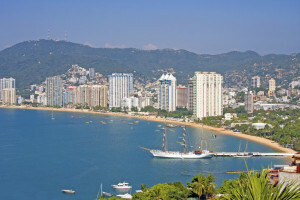 Acapulco is one of the most beautiful towns in all of Mexico. On three sides of its beautiful bay the towering Sierra Madre del Sur mountains reach right down to the shoreline. A beautiful beach separates the deep blue water of the bay and the impressive sky-scraping hotels and office buildings. Acapulco has become a popular location and resort spot.